A new book in the religion/spirituality market informs listeners about the most enormous and longest competition the world has ever seen: the Christian Olympics, otherwise known as the "Christian race" that the Apostle Paul wrote about nearly 2,000 years ago. 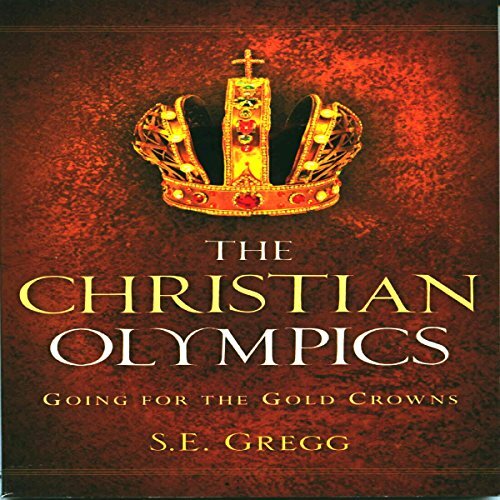 In The Christian Olympics: Going for the Gold Crowns, author S. E. Gregg unveils the Bible's comparison of the Christian race to the Olympic Games. Paul wrote to a Hellenistic culture - one steeped in Greek philosophy, culture, and athletics - and so for the Christians of his day, marathon footraces run by Greek Olympians provided the perfect metaphor for the endurance, longevity, and persistence needed to successfully finish the race of faith. Those who do, Gregg reminds us, will receive crowns of gold from the Lord himself. A new understanding of and exhilaration for the Christian life, pursued with the vigor of a spiritual athlete, will help listeners to endure their problems and suffering. As a result, Gregg hopes to stoke the fires of passionate living for God and encourage listeners to look forward to what is ahead. Weaving in applications for both individuals and families, Gregg developed biblical strategies to help us run our races well, just as athletes develop game plans to help them win their competitions. Gregg examines the rich comparative examples Paul gave us in the Epistles: The lighting of the flame at the Olympics is reminiscent of the fire of the Holy Spirit at Pentecost, which was the divine opening ceremony. When the book of Hebrews says to "run the race with patience", it is referring to actual marathon footraces popular in the Greco-Roman culture. Just as successful ancient Olympians received crowns made of laurel leaves, believers who run the race of faith to the finish line will receive crowns of gold at the closing and rewards ceremonies in the sky! I enjoyed the book it gave me a new perspective on the Christian race. It has a way of putting things into perspective. Would you consider the audio edition of The Christian Olympics: Going for the Gold Crowns to be better than the print version? N/A. I prefer audiobooks to reading. The information to parents, marrieds and singles was spot on. The talk to singles and how it is a blessing to have more time to do more service and have a more personal relationship with Christ. Yes, the richness of the message is more easily understood. Perfect for anyone seeking a bump in the right direction! I was given a copy of this tittle in exchange for my unbiased review. This is a wonderfully written book! It is an eye opener for a seasoned Christian and would be a great foundation to a new believer as well. This is a must have title for those looking to refresh their walk with the Father and gain new perspective on what we are supposed to be doing, what our purpose should be and what goals we should all strive to achieve. I would highly recommend every Christian give this a listen! I am sure I will listen again and again! The reading of this title is clear and fluid. I enjoyed listening! Yes. It definitely makes you think about your faith and how to endure in the Great Race. Having narrated the book, I can say with authority that I read it probably a lot more carefully than most. I love books that make me think. S.E. Gregg made me think hard about my faith. She revealed things in The Christian Olympics that I never realized. We are all participants in the Great Race. Some are maintaining their easy stride, some are limping along, some barely walking. I think I've been in all three in different times in my life. If you want to get to the finish line with those golden crowns waiting for you, you'll do yourself a big favor by reading this book. It'll challenge you for sure!